The Queen and The Duke of Edinburgh have hosted a reception at Buckingham Palace to launch the UK-India 2017 Year of Culture. Her Majesty and other members of the Royal Family met many people from various fields of work including performing arts, fashion, food, literature and sport in order to celebrate the deep cultural ties between the UK and India, in the 70th anniversary of India’s Independence. The Earl of Wessex, The Duke and Duchess of Cambridge, The Duke and Duchess of Gloucester, Prince and Princess Michael of Kent and Princess Eugenie also attended the reception on Monday 27 February, 2017. Upon arrival, guests were treated to Indian-themed performances and a special Indian menu of canapés made by Royal chefs working alongside chefs from Veeraswamy, the UK's oldest Indian Restaurant. 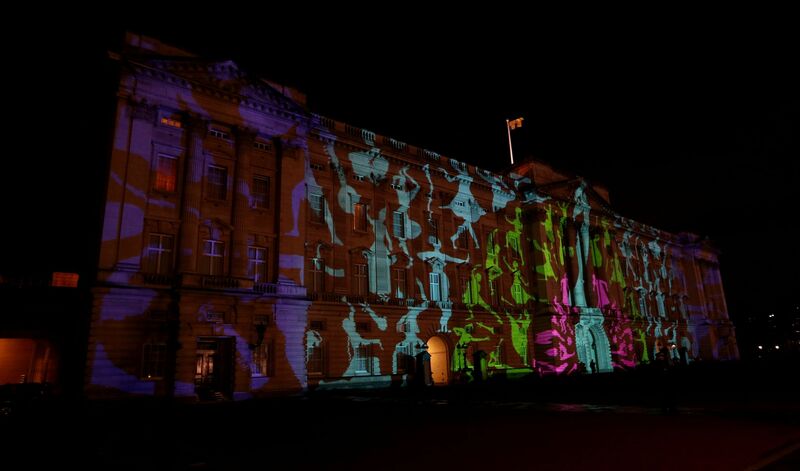 And a huge projection was designed for the front of Buckingham Palace which featured a peacock, which is celebrated as the national bird of India. Within the feathers, dancing figures could be seen. A Royal Collection display also gave guests a chance to see items from Royal visits to India, as well as gifts and manuscripts from the Royal Library. Earlier in the day the Band of the Grenadier Guards played a selection of Indian themed music, including tracks from the film Slumdog Millionaire. Her Majesty's first State Visit to India, accompanied by The Duke of Edinburgh, was in 1961, as the guests of Dr Rajendra Prasad, the first President of India. My husband and I will take with us the most vivid impressions of places, events, and people. Since then, Her Majesty and His Royal Highness have paid two further State Visits to India (in 1983 and 1997) and received three incoming State Visits to the UK from India (1963, 1990 and 2009). The most recent visit to India was by The Duke and Duchess of Cambridge in 2016. To celebrate the 2017 year of culture, a programme of events and exhibitions which will take place in both UK and India, in partnership with the British Council, the Indian High Commission in London, UK institutions and their Indian counterparts. The aim is to connect and inspire people to celebrate the long-standing relationship and vibrant cultural history.